Serious photographers sometimes spend hundreds of dollars on an incident light meter--a small handheld device that measures the light falling on the subject. Luxi is a $30 iPhone accessory that promises to do the same job using just your existing phone. Why do some photographers carry a separate light meter when there's a perfectly good one built into their camera? In a nutshell, it's because standalone incident light meters are more accurate over a wider range of photographic situations. That's because they measure the light falling on the subject from the direction of the camera, not the reflected light that bounces back into the camera. If you've seen a photographer hold a small gadget near his or her subject, pointing what looks like a small white bulb in the direction of the camera, that's what's happening: The photographer is measuring the light and using its recommendation to set the camera's aperture and shutter speed. Luxi replaces that expensive, standalone gadget with your iPhone. It is composed of two parts: a plastic adapter that slips over your phone (there are versions for the iPhone 4/4S and the iPhone 5/5s) and a free companion app. The adapter positions a diffusion dome over the front-facing camera, making your phone look a lot like a traditional light meter. To use Luxi, start the app and hold it near your subject, so it points back in the direction that you're planning to shoot from. Based on these conditions, Luxi then recommends an aperture, shutter speed, and ISO. The app is straightforward--no needless complexity or photographic voodoo. Luxi continuously shows you the relevant camera settings (aperture, shutter speed, and ISO) based on whatever light is currently hitting the diffusion dome. Tap the Hold button to lock in the settings--that way you can walk back to your camera, for example, and not lose the relevant recommendation as the lighting changes. You can also choose which of the two settings you want to lock in. Specify the ISO you want to shoot with and your desired aperture (so you can get the depth of field you're looking for, for example), and Luxi picks the right shutter speed for your situation. Or lock a fast shutter speed and let Luxi recommend the aperture. 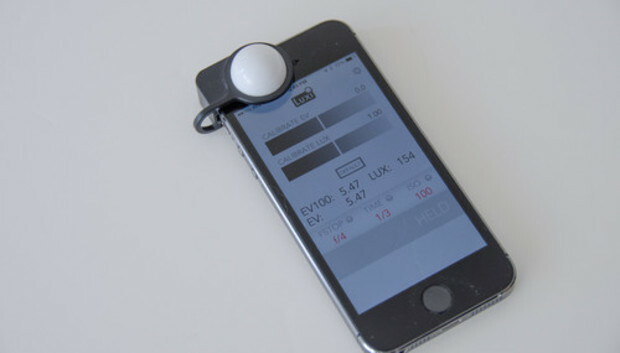 And while I can't imagine why you wouldn't just stick with the Luxi app--it works superbly and has no learning curve--you can use the Luxi hardware with any light meter app in the App Store. And yes, there are several, both free and paid. The Luxi adapter is designed to fit a naked iPhone, so you'll likely have to remove your phone's case to use it--which is the only downside. Luxi is ideal for advanced DSLR photographers who want to get the accuracy and flexibility of an incident light meter without carrying yet another gadget. If you don't have a light meter yet, Luxi gets you get in the game for less than a tenth the cost of a traditional one--and the accuracy is superb, delivering the same kind of results you'd get from a "real" meter. Luxi won't help point and shooters who don't worry about tweaking the camera settings, obviously, but it's right for folks who are dissatisfied with what they get from their built in light meter, especially in challenging lighting conditions.